All the world’s a stage and all the men and women (reporters) merely players (liars). “Objectivity is a central philosophical concept, related to reality and truth, which has been variously defined by sources.” This is the quick Wiki definition. Basically this is the truth, reality, with verifiable sources. So what’s all the the fuss about the Brian Williams helicopter episode? It’s journalism as you like it. Seriously, a laugh can be shared. A New York Times piece informs us that NBC should investigate this chopper issue. And this poses the obvious question. Don’t all reporters lie at some point in their career? Maybe just a little white lie? Potentially there’s motivation behind this crude allegation. Just maybe Brian is paving the way for Hillary. Just maybe Brian is trying to say that a little sniper fire controversy is good for ratings. Maybe this is good for show biz. You can visualize it now. Brian begins to cry for fear of losing his job and Hillary comes to his rescue. She confesses that she too had once been caught up in a sniper fire controversy, while she sports a Hillary for prez sticker displayed on her forehead. Both exchange their sympathies and the audience is emotionally connected. As an added token, they could bring Bill out on stage. With the left hand clinched in all his posterity and a prez sticker proudly displayed on his forehead, Bill could resort to playing saxophony. Maybe someone could insert a fake cannabis stick behind his ear and address the admission of not inhaling. Bill could wipe the tears off Brian’s face for theatrical gesture. While we’re at it we could have Sarah from Alaska straightening a picture in Brian’s office. 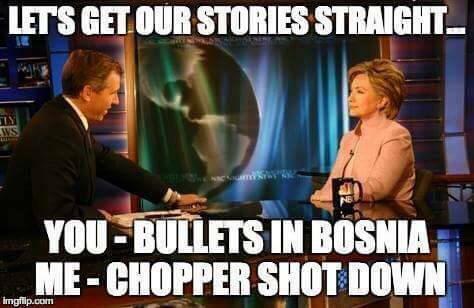 She’s not choosy and she has no problem being a reporter or running for president. You see the weather is not so great in Alaska. Not to offer any advice to anyone, but some may feel that Brian is qualified for president, or at least vice president. He’s comfortable in a suit, he has gone through the sniper fire campaign, and he’s comfortable in front of the camera. Warning. The risk of reporters or politicians stretching the truth is great. You have been forewarned. On a more sober note, one wonders why Brian is under attack while more relevant news is being ignored. It would seem as yet another distraction, and by now viewers are getting used to these tactics. Why the diversion this time? Could it be a ratings problem? Who will be the permanent replacement for Brian? very useful tool for every site admin (for content creation and SEO). What’s up mates, nice piece of writing and good arguments commented here, I am really enjoying by these. muy grandes y eludir caer en la especulación. in each cooking and curing. They ill show you a story in the turmoil among the Greek Gods. within the email body itself. Carrier Bags For Sale is onee of the leading supplier of Paper Carrier bags in UK. SEO gives lots of pain due to use of un-ethical and spam SEO techniques. can help you achieve this business objective. In addition, there will be links in SPIRE, UMass’s online student information system. of books and magazines are on sale for 20% up to 80% off. Many thanks for another fantastic article. Awesome work. I don’t know the reason why I can’t join it. Is there anyone else having identical RSS issues? the first 10 to 15 minutes are usually lost just trying to figure out how to begin. Any suggestions or hints? This article gives clear idea designed for the new users of blogging, that genuinely how to do blogging. Enjoy direct contact with the developers throughout the duration of your project. small-stakes whales dusting off some of their new-found casino money. The software program is competent and withdrawals are smooth.